Jan Estep, “David Lefkowitz: Other Positioning Systems,” in David Lefkowitz: Other Positioning Systems (Rochester, MN: Rochester Art Center, 2010). Published in conjunction with Lefkowitz's solo exhibition, David Lefkowitz: “Other Positioning Systems,” Rochester Art Center, September 11, 2009 – January 10, 2010. David Lefkowitz, Desktop Travelogue, Los Angeles, CA, 2009, oil on canvas, 48" x 60". for one of the major 3G wireless networks played all summer long. Two young children dressed up as Hansel and Gretel roam the streets of New York City. Walking arm and arm, clad in dirndl skirt and lederhosen, the pair make their way through the hustle and bustle of passersby. True to the fairy tale, Gretel drops bread crumbs behind her as they venture on. But each bit of bread meets an untimely mishap: a high heel squashes one, scavenging pigeons grab another; a third falls down a sewer grate. The two walk on unaware, mesmerized by the city sights, and when they finally turn around to check on their way-markers they momentarily panic when they realize they’re gone. But then Gretel reaches into her picnic basket and pulls out a smart phone; with a few keypunches a GPS app comes up on screen and plots their way back home. Assured of their location, they pocket the device and skip off into the night. A lot can be read into this scenario, all of which leads me to David Lefkowitz’s artwork. The seeming ease with which the children move between breadcrumb markers in physical space and a screen-based street map in virtual space attests to the fluid intermix of digital and analog modes of experience. We live in a world where representations and technological mediations of real space are so common as to be utterly naturalized, seamlessly interchangeable with direct, firsthand experience. In fact, it is hard to distinguish whether or not one way of experiencing the world is more real than the other; both can be factual and both can be deceiving. For many of us, the idea of “pure” experience in a hierarchical relationship to “mediated” experience has fallen by the way side, as phenomena are perceived with a robust conglomeration of natural and acculturated perspectives. The body of work collected for “Other Positioning Systems” teases apart the knotty implications of this virtual/physical mixing. Lefkowitz’s new series of paintings titled “Desktop Travelogue” illustrates this point. Each painting pictures a different built environment: Chicago’s Loop with its Sears Tower, the Lourdes Cathedral in France, a bridge crossing the Mississippi in downtown Minneapolis, and the largest canvas shows the Getty Museum in Los Angeles. Each view is seen from an aerial perspective but skewed, as the built structures warp and bend across the underlying topography. The landscapes are recognizable but also seem generic, painted with an identical color palette and sensibility no matter where the location. These could be anywhere, and any contemporary building, a sameness that belies the specificity of the sites yet attests to the power of generalization and abstraction even in the face of direct observation. Significantly Lefkowitz’s source material for the paintings comes from Google Earth. He has rendered the found imagery fairly accurately, meaning the odd oblique viewing angle and the buckling distortions are inherent to the satellite-generated compilations. As with many of the artist’s works, “Desktop Travelogue” presents viewers with representations of representations. The deliberate self-reflexivity of that gesture draws attention to the contexts at work, the context of virtual global imagery (of Google Earth) and the context of painting, both of which portray three-dimensional space on a two-dimensional plane. For all their recognizable illusionism, these common means of picturing the world are radically different than the world they reference. Yet humans negotiate their environments using these tools in quite matter-of-fact ways. It only becomes strange when we think about it too hard; otherwise, we take the tools for granted. Without being heavy-handed and with an ironic sense of humor Lefkowitz asks us to question this ordinary acceptance, to become aware of the conundrums—perceptual and conceptual—at the heart of our vision and experience. One of these conundrums is the way the frame itself limits and defines the phenomenon at hand. The framing devices for what we see are many: the frame of language, captions, and titles; of ideology, conceptual paradigms, and religious beliefs; of personal experience, common opinion, and social mores. We never experience things “bare” as it were, yet the frames are not always remarkable for the influence they have on the way we perceive things. Because we don’t typically dwell on the background information we bring to the world, our vision can appear much less mediated than it actually is. In the art world the frame is neutralized by the strength of the aesthetic convention to present paintings housed inside wood or metal casings. Rather than being a neutral choice, the frame is brought into high relief in Lefkowitz’s work. Paintings like Event (1991) and Innovation #5 (1999) subvert the usual relationship between canvas and frame by pushing the painting to the periphery. And paintings such as Nature World (1994) draw attention to the act of framing with its use of anti-aesthetic materials. The deliberate and literal reworking of the frame-space resonates metaphorically to remind viewers that objects have meaning only within a prior network of institutional and social practices. David Lefkowitz, Innovation #5, 1999, oil on OSB panel, 22" x 26". Innovation #5 comprises a shaped panel of engineered Oriented Strand Board (OSB) left raw in the center but with a hyper-realistic, painted bark frame. It is a subtle perceptual trick, urging viewers to second-guess their initial impressions upon more careful observation. Once one realizes that the frame is not “real,” doubt sets in and one begins to question whether or not the pressed-wood pattern is also fake. The effect is triggered by an unexpected use of materials and the trompe l’oeil illusionism. Looking a bit like a boxing ring seen from above, Event portrays a crowd of onlookers gathered at the canvas edge where a distinct framing structure would normally reside. Loaded with cameras and pens-and-paper, the men peer into a void space that resembles an empty cloudy, gray sky. As they wait in anticipation, the event shifts from whatever is going to happen center stage to the nature of their expectations itself. By inference our own expectations as viewers become the target, the assumptions we have about how paintings should be organized and by analogy the host of value judgments and limitations we project onto whatever we see generally. Lefkowitz never says what those values should be in a prescriptive sense, but he does ask us to consider the fact that vision is a highly complex and contextually embedded phenomenon. The clunky, industrial frame of Nature World also defies expectations and thereby brings our own into focus. Parallel rows of crude two-by-fours, held together with black drywall screws, encircle a delicately painted pastoral landscape, akin to an early American, Hudson River School scene. Stuffed in between the gaps in the wood framing, pink fiberglass insulation is the antithesis of artistic refinement. The shocking artificial color sharply contrasts with the subdued natural palette at the center. The juxtaposition of common construction materials with classical fine-art painting is funny, and startling. It suggests someone (the artist) looking at how experience is structured in antecedent ways, conceptually through various systems of two-dimensional representation, and physically through architecture and industrial production processes. Simple but effective, the combination nudges us out of our habitual ways of apprehending the world. David Lefkowitz, detail of Vista, 2008, watercolor on cardboard. The artist uses this strategy in a number of more recent works as well. The soft but skillfully rendered watercolors of Vista (2008) stand out against the large sheets of plebeian cardboard used as their base. A viewer must imagine the same person who paints “serious” paintings in his traditional, white-walled studio is also the person roaming alleys for discarded packing boxes and leftover building supplies. Any and all media can be repurposed for conceptual effect. Sculptures of sheetrock and joint-compound, drawings made of twigs and hot-glue, and three-dimensional paintings made of Styrofoam sit alongside the artist’s more traditional representational oil paintings. Despite the larger physical scale of the more sculptural objects, neither kind of artwork is given more status over the other but instead collectively trouble the usual separations imposing such hierarchies. It is not the consistency of a single medium (painting) that holds the work together, but the consistency of the questions the works ask: how is experience structured by representational systems, to what extent are everyday events impacted by the lenses through which we view them, and what is lost and gained by naturalizing mediated processes? 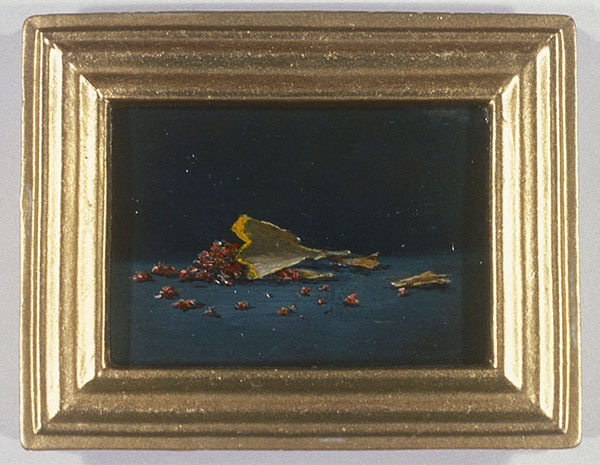 David Lefkowitz, Pictures of Common Detritus, Pencil Shavings, 2000, oil on wood, 2.25" x 2.75". Lefkowitz plays again with the inversion of scale and status in “Pictures of Common Detritus” (2000/2009), a series of small, though life-size oil portraits of found bits of trash and debris. Framed in prefabricated ornate golden frames, purchased from a local hobby shop, each tiny painting is a detailed study of the chosen figure: small clumps of dust or plaster, lint, pencil shavings, a wad of chewed gum, a lone Cheerio, a twist tie, a dead fly. They are painted with dramatic lighting, multiple glazes and undercoating, and chiaroscuro modeling. All the artist’s trained skill is brought to bear on these lowly subjects. In gallery exhibition, they are installed as if they are much larger paintings, each spotlit and given six feet or more of space. From far back they look indistinguishable, a fitting first impression given the usually overlooked, forgotten subject matter. But curiosity draws a viewer in, where they are either pleasantly surprised or mildly disappointed (“all this for old gum?”). The artist’s gentle joke pokes fun at the romantic aspirations of the painter to make grand paintings but the care with which the portraits are painted saves them from being simply one-liners. Technique gives our eyes something to appreciate, helping us linger with subjects we normally ignore. In that space of reflection we may just work ourselves in our thinking to the underlying concerns about the nature of representation and value judgments in general. A sense of humor invites a more thoughtful thinking-through in two other works that consciously take on the museum site as the frame for artwork, the two-part video installation Gallery View (2009) and the series of small paintings titled “Fixtures” (1991-2009). Gallery View/Angle 1 is a scaled replica of a behind-the-scenes museum preparatory space; a stack of miniature stretched canvases lean against the wall near an industrial grey trashcan. The scene is complete with a meticulously detailed broom and realistic pile of debris swept into the far corner. A small opening in the wall allows viewers to poke their heads into the modeled space and peak down the hallway. It is staged as if in the middle of the installation process, an unfinished state that museum goers hardly ever see. 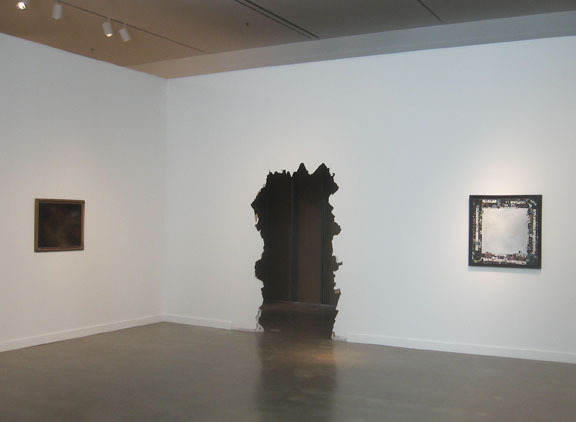 At the Art Center, the work is set inside a darkened pass-through space that connects one main gallery to another; the doorway to the space is a gaping, torn-edged hole, looking like a demolition team had busted through the wall without repairing the damage. David Lefkowitz, exhibition view of Gallery View, 2009, Rochester Art Center. In the midst of walking through the exhibition, confronting Gallery View/Angle 1 is another one of those unexpected events that Lefkowitz takes such pleasure presenting to us. If we were not thinking about the importance of framing and institutional context before, this modeled space makes it clear, as we get a fabricated glimpse of the architectural and institutional substructure that supports the more formal and public areas. Looking at the room it is difficult not to think about the myriad curatorial and artistic decisions that go into creating an exhibition, decisions that fundamentally shape the experience viewers have. An analogous pattern exists outside the museum; others and the contextualizing choices they make, whether we acknowledge or know of their influence, are constantly directing us. A further complication resides in Gallery View/Angle 2, a live-feed security monitor positioned at the front entry desk that broadcasts a continuous view from a small camera mounted in one corner of Gallery View/Angle 1. The camera feed taps directly into the Art Center’s main security system, and the view sits in a grid of live screen shots from cameras placed throughout the building. The scaled model room is so life-like that initially the video image seems real, just another surveillance view for security purposes. But the illusion is periodically interrupted whenever a large head pokes inside the opening to Gallery View/Angle 1 and catches the camera’s gaze. Compared to some of the more heady paintings, the perceptual trick of the video installation causes a visceral reaction, as what one thought was the case is overturned in an instant. “Fixtures” create a similar perceptual disconnect. Painted boards that resemble ordinary light sockets and utility plates are placed throughout the Art Center, installed on the wall where one would normally find the originals. Since they are not isolated with lighting or title cards it is highly likely that viewers will not even notice them. They exist for those paying close attention to their surroundings, examining the entire visual surface available to them not just the identified art. Each Fixture provides conspicuous clues that they are not actual utility plates: the color is strange, the brushwork and undercoating are clearly visible, and although the plates are the right size and scale, the painted sockets and attachments do not conform to standard shapes but are absurd variations. It is a not-so-subtle architectural intervention that paradoxically is potentially never seen. This mirrors another perceptual conundrum motivating Lefkowitz’s art, that what strikes us at first glance as obvious is anything but. David Lefkowitz, Fixtures, oil on wood, installed at Rochester Art Center. In the Hansel and Gretel 3G television commercial, old world navigation meets new world digitalization just as old-world storytelling meets current social culture. David Lefkowitz also deftly navigates the old and the new, painting being one of the oldest art forms with the strongest formal techniques and traditions. Yet the work is absolutely contemporary given its subject matter. The TV characters effortlessly merge embodied haptic experience with mediated optical experience and the implicit message is that technological advances are safe, reliable, and unequivocally good, even able to protect our children on the city streets at night. Lefkowitz may be more skeptical and cautious than that, but neither is he a luddite. Rather, it feels like he is taking stock and asking questions, curious to see if we too are puzzled by what’s going on. “Other Positioning Systems” offers a chance to explore the wide-ranging implications of this old-world/new-world condition in which we can either follow the trail along the ground or skip off into the future holding a smart phone as our flashlight.